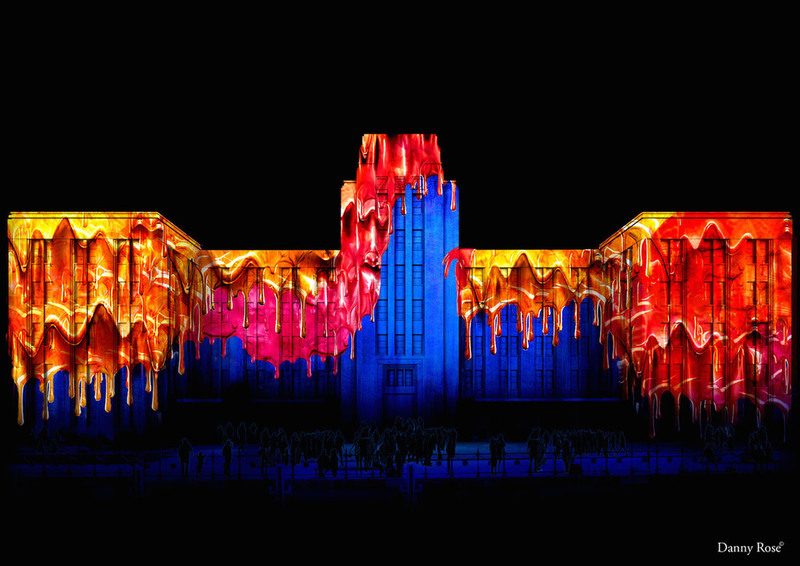 Vivid Sydney is back, bringing illumination and inspiration to the Harbour City. Whether you're into laser light shows, 3D-mapping projections, large-scale installations, edgy gigs or intriguing talks, you'll find something to entertain you in this ever-popular event, which this year offers an extended 23-night run until 18 June. Kick things off at Vivid's hub at Sydney Opera House and Circular Quay, with more than 60 cutting-edge lighting installations along the Vivid Light Walk, including major projections at the Customs House ('Sydney's Hidden Stories'), MCA ('The Matter of Painting') and Cadmans Cottage ('Impossible Voyage'). 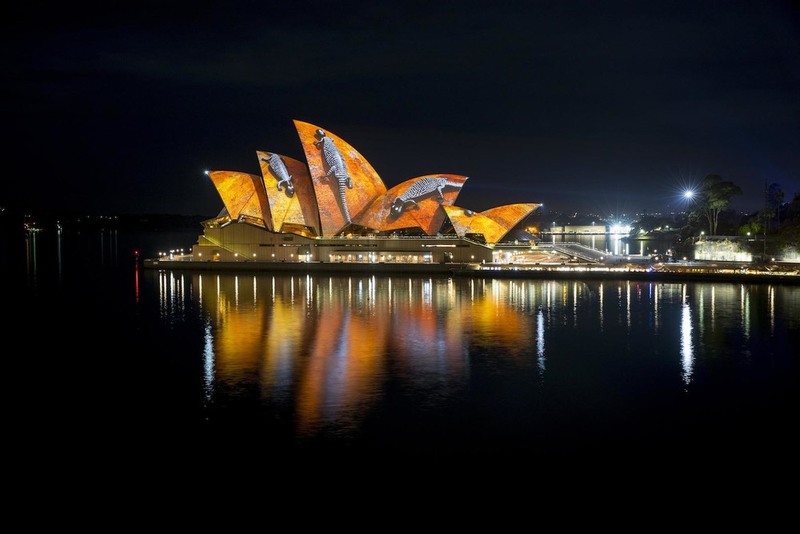 A wow this year is the 'Lighting The Sails, Songlines' at Sydney Opera House, which screens work by six artists from different Aboriginal clans onto the building's shells. From vibrant flora and fauna to black-and-white human figures and earthy brown palettes it's a strong statement, including work by Fizz favourite, street artist Reko Rennie. Keep going into The Rocks, Campbell's Cove and Walsh Bay for more, including luminescent laneway stunner 'Tectonic', formed from 1,500 suspended, upcycled PET bottles filled with tonic water. Harbour Lights sees boats and ferries lit up with LEDs, while for the first time many of the skyscrapers facing the Quay are given the colour-block lighting treatment ('Dress Circle'). Intel's 'Drone 100' will see 100 illuminated drones take to the skies for five nights only (8-12 June, 7.55pm), performing a colourful choreographed seven-minute routine over Sydney Harbour. Controlled by one main pilot, the bespoke animation will be set to music. You can spy the towering columns of light created by 'Geometrics' from across town, let alone from beneath the kinetic sculpture at central-city precinct Martin Place; nearby 'Fountain' live-streams global birth data as 'human water droplets' to highlight our burgeoning 7.4 billion population. Further afield, Central Park teams a 'Silent Disco' with arty projections onto the former Carlton & United Brewery building in 'X Factory' (5.30pm-10pm). Vivid's wildest new precinct for 2016 is Taronga Zoo, featuring 'Be the Light for the Wild', an illuminated trail of 10 critically endangered species from Australia and Sumatra, including the Asian elephant and platypus. 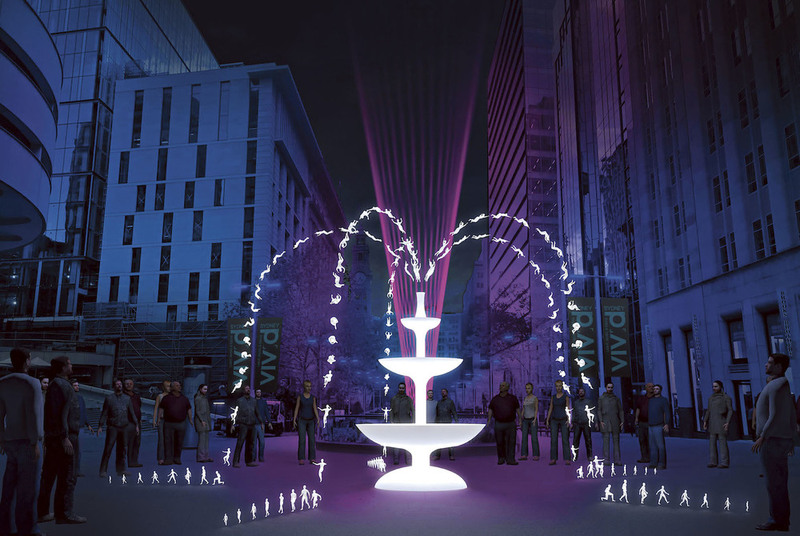 Created by Ample Projects, the giant multimedia sculptures include interactive lighting, sound effects and moving parts, making them among the largest and most technologically advanced lanterns to appear at Vivid. A supporting cast of creatures, from an echidna to a crocodile and pygmy tarsiers, ups the cuteness ante. Pre-purchase tickets online ($17.95 adults, $11.95 kids aged 4-15); entry costs aid the conservation effort. A new precinct for 2016 is The Royal Botanic Garden Sydney, where trees and plants will be lit up with a magical cluster of light art for Vivid. Highlights include the glittering 'Cathedral Of Light', a sinuous long arched tunnel onlookers can walk through, framing views of the Opera House. Made up of thousands of dazzling LED lights, it takes its cue from the traditional arched windows of historic churches and is selfie heaven. Also look out for 3D-mapped fig tree projection 'Synthesis', interactive installation 'Sentiment Cocoon' and fantastical 'Will 'o the Wisps'. Tickets for Björk's two DJ sets for the opening of 'Björk Digital' at Carriageworks (3 and 4 June) went quicker than a hot toddy in a Reykjavik bar, but you can still see the world premiere of her new touring virtual reality project, which takes over the evocative former rail yards until 18 June. Divided into five spaces and accompanied by collaborations with key filmmakers and programmers, the exhibition draws heavily on videos created for recent album 'Vulnicura' (above) and 'Biophilia', including immersive spaces, surround-sound and 360-degree film. 'I felt it was time to premiere my recent virtual reality stuff,' says Björk, 'We have made seven 360-degree videos for 'Vulnicura', and I am enthusiastic about this natural continuity of the music video; the intimacy, and total merge of surround-sound and vision, makes VR an ideal home.' It's free to attend, but book asap for the virtual reality rooms. New Order's four gigs at the Sydney Opera House, showcasing recent album 'Music Complete', may be sold out, but you can still see images of the band, including iconic portraits of their earlier incarnation as Joy Division, in a free photography exhibition in the Concert Hall Northern Foyers. By UK photographer Kevin Cummins, known for documenting the Manchester music scene, it runs until 5 June (6pm-late). The show is accompanied by artwork for the band by seminal British graphic designer Peter Saville, famous for setting the house style for Manchester's Factory Records label as their hugely influential art director. As part of Vivid's 'New Order Project', a talk with New Order in conversation with filmmaker/MFS label head Mark Reeder has just been announced for Friday 3 June (6.30pm, Playhouse); get in quick. Factory Design District takes over creative co-working space COMMUNE in Waterloo for three days, hosting industry talks, demonstrations and workshops, celebrating Australian design talent, the authentic and the handmade. Over 30 local designers, producers and makers are on board, with a curated exhibition including furniture by Jonathan West, bespoke joiner JP Finsbury, Boardgrove Architects and Studio Liam Mugavin, lighting by Abalos and accessories by The Fortynine. Up-and-coming Thirroul-based designer Trent Jansen, who worked with Marcel Wanders, is speaking on Friday (4pm-5.30pm, ticketed), while established brand founders from Dinosaur Designs, Tait, MUD Australia and ISM Objects give a talk Sunday (11.30am-1pm, ticketed), alongside a showcase of their recent designs. 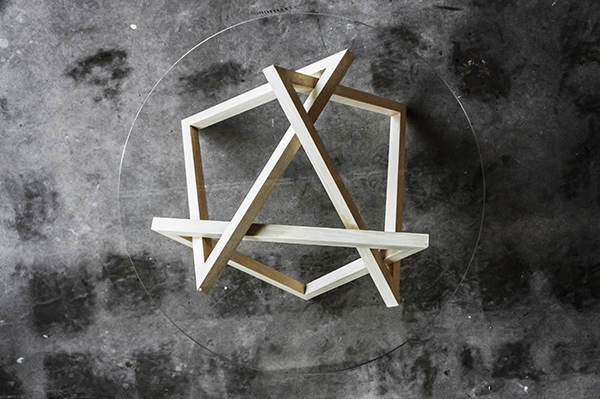 New Zealand lighting and furniture whizz David Trubridge discusses design copyright on Sunday (2pm-5pm), which is also market day with COMMUNE's Locally Made (11am-4pm) featuring some of Sydney's best inner-west makers across crafts, arts, fashion and music. See Factory Design District's own website for full details. Food and drink is local too, with contributions from Newtown's Young Henrys brewing co, Bloodwood and Continental Deli, St Peters' Urban Winery and Mecca Coffee.